Welcome to the law offices of Moriarity & Badaruddin PLLC, a highly regarded law firm committed to providing clients the most effective level of service. Adhering to the principles of honesty, integrity, and common sense, we take pride in the caliber of our attorneys and reputation for quality legal work. This formula for success is built upon years of education, experience, and our ability to represent numerous clients in a wide variety of cases. As a result, we have handled high profile cases with noteworthy results all across the United States. Although we maintain the dignity of the law profession at all times, we also realize that we need to instill client confidence in our abilities. To accomplish this, we adhere to a people-oriented, informal approach that makes our clients and legal associates feel comfortable as we establish trusted, working relationships. We also believe down time is important. While preparing for many of our cases, it is not unusual for our firm to invite clients, co-counsel, paralegals and investigators to our beautiful Madison River Ranch office near Three Forks, Montana. This office provides the perfect backdrop for working as well as relaxing, and our guests are encouraged to cast a line into the Madison River winding through the ranch. We are proud of this methodology and pleased to offer our clients such an unusual and fun approach to the practice of law. We value our work and the legal system, but we also place the relationship with our clients in the highest esteem. In June of 2005 we hosted the Montana Trial Lawyers Board of Directors' meeting at our office at the Madison River Ranch and have held various meetings and seminars as well in an effort to give back to the legal community. What We Stand For We take pride in the fact that our firm remains small and manageable. The firm consists of two partners and their assistants, all of whom work together on every case. We receive hundreds of calls and letters every year from people needing representation and attorneys seeking our help. Regrettably, we can only accept a small percentage of these potential cases so as to provide the very best representation for those that we do choose to represent. We wish we could help everybody, but unfortunately, we cannot. We at Moriarity & Badaruddin PLLC pride ourselves in accepting cases with underlying social value and take great satisfaction in representing the little people who need our help the most. We do not represent corporations. Instead we represent people, good people, little people not corporations. We highly respect our work philosophy and are proud of our clients because they stand tall amongst giants and fight for their rights. We invite you to acquaint yourself with our attorneys. Individual biographies highlight each lawyer's education, attributes, and the successful law careers that set Moriarity & Badaruddin PLLC in a legal league of its own. I graduated from the University of Wyoming School of Law in 1970, was admitted to practice in 1970, and have been a practicing attorney ever since. I began my legal career in Cheyenne, Wyoming with the firm of McClintock, Mai and Urbigkit in 1970, was named a partner in 1971, and practiced with that firm until 1974 when I moved to Casper, Wyoming to work with Robert Rose and Gerry Spence. Shortly thereafter Judge Rose was named to the Wyoming Supreme Court, and the firm of Spence and Moriarity was born. In 1978 we moved the firm to Jackson Hole, Wyoming, and the name was changed to Spence, Moriarity & Schuster and subsequently to Spence, Moriarity & Shockey. I had the honor of being the partner of Gerry Spence for over 30 years. In 2004 I became the head of the present firm of Moriarity & Badaruddin PLLC, taking over the Spence, Moriarity & Shockey practice in Salt Lake City, Utah and adding additional offices in Wilson, Wyoming; Cheyenne, Wyoming; Three Forks, Montana; and Missoula, Montana. I have been involved in many murder cases, several of which were death penalty cases, and none of my clients have suffered the ultimate punishment. I had the honor of working with my partner Gerry Spence on the defense of Imelda Marcos, one of the more interesting and historic cases ever tried. Gerry and I were invited and honored to go to London, England to conduct a mock trial of Lee Harvey Oswald with the prosecutor being Vincent Bugliosi, the prosecutor of Charles Manson. In the mock trial, we were allowed to use the actual exhibits from the Kennedy assassination, and the witnesses who testified were the actual witnesses to the assassination of President John F. Kennedy. I still have, and will always have, a vivid memory of the incredible feeling of holding the actual gun that killed President Kennedy. In my early years, I did a lot of criminal work and enjoyed the day to day/hand to hand combat in the courts dealing with preliminary hearings, motions, and finally the jury trial. Now, I always like to have a couple of criminal matters in process because I know that most criminal cases, unlike civil cases, are resolved by a jury. -Confidential settlement in a personal injury case in New Mexico involving the eruption of a gas pipeline which was the largest settlement in the State of New Mexico and one of the largest in the country. -Confidential settlement in a wrongful death case again in New Mexico involving a pileup on I-40 that was among the largest settlements ever in New Mexico. Confidential settlement in a personal injury case in Idaho involving an accident at a sorority house at the University of Idaho that left my client a paraplegic. -Confidential settlement in Miami, Florida involving the wrongful death of an eighteen year old in a car accident. Confidential settlement in an accounting malpractice case in Las Vegas, Nevada. -Confidential settlement in a personal injury case in Nevada for an assault at a casino leaving my client a quadriplegic. Confidential settlement in Montana in a personal injury suit involving an explosion of a gas line. -Confidential settlement in Utah involving the wrongful death and personal injury of a family involved in a truck/car collision. Confidential settlement in Washington involving the wrongful death and personal injury of victims of a shooter at Fairchild Air Force Base. -Confidential settlement in several train/vehicle collisions in Utah, Illinois and Wyoming. (I am presently handling one case in Montana.) I have also developed an expertise and special knowledge in railroad cases. These cases generally result in tragic deaths of innocent people even though the railroads spend a lot of money trying to convince the American people that the injured victims are the wrongdoers. Cases in this area have involved a family in Utah, a person in Illinois, and five teenagers in Douglas, Wyoming. I have been involved in many other railroad cases as well. -Confidential settlement of a case involving a hospital that negligently collected blood contaminated with HIV and then permitted the contaminated blood to be given to a patient in the hospital resulting in the patient contracting HIV and dying. -Confidential settlement against a drug manufacturer that sold contaminated medicine to a kidney patient resulting in an untimely death. -Defense of Frederick Tokars in re: State of Georgia vs. Frederick Tokars featured live on Court TV. -My long time partner Gerry Spence and I also successfully defended Imelda Marcos. -Defense of an insurance agent in Idaho who was charged with fraud, forgery, RICO, inter alia - in 164 predicate acts. My client was not convicted on any of the charges. I worked during law school for the firm of Baker & McKenzie researching issues related to International Trade, as well as the Pension Benefit Guaranty Corporation researching issues related to ERISA. I graduated from Emory University School of Law in 1990 and was admitted to practice law in Georgia that same year. I had the privilege of serving as Assistant Public Defender at the Fulton County Public Defender's Office in Atlanta, Georgia, where I was a staff attorney defending indigent citizens accused of felony offenses. During my three years at the Public Defender's Office, I was counsel for the defendant in countless trials and appeals. In 1993, I opened my own office and continued to defend criminal cases in the state and federal trial, appellate, and habeas courts in the Atlanta metropolitan area. I also represented plaintiffs in personal injury cases. In 1994, I attended the Trial Lawyer's College in Dubois, Wyoming. In 2002, I moved to Missoula, Montana, and represented plaintiffs in civil actions, such as professional negligence, products liability, and civil rights violations. 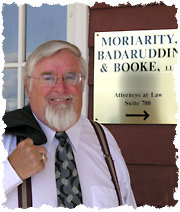 In 2005, I became a founding member of the law firm of Moriarity & Badaruddin PLLC. Since that time, I have continued to represent plaintiffs in civil actions and defend criminal cases in state and federal trial and appellate courts in Montana, Wyoming, Utah, Arizona, California, Oregon, New Mexico, and Nevada.